« A quick shot of the thrill of science. What’s wrong with this figure? (Round three). In the process of finishing up a paper, I came across this figure (Gilbert 2007). Figure 1. 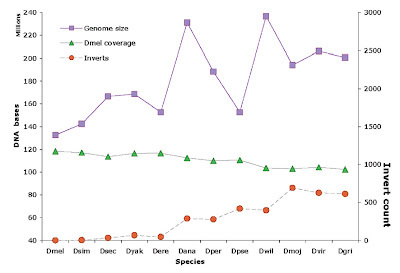 Drosophila species assemblies, showing assembly sizes and coverage of these by D. melanogaster genome DNA (top and middle lines, in megabases, left ordinate), and counts of chromosome segments inverted relative to Dmel (bottom line, right ordinate). Species on abscissa are taxonomically ordered with Dgri most distant from Dmel. Two questions. One, why are these points joined by lines? Two, what does “taxonomically ordered” mean? I suspect it is equivalent to “phylogenetic sequence”, which was discussed in a previous edition of “What’s wrong with this figure?“. Here is the phylogeny that is most often seen in discussions of the 12 Drosophila genome sequences (in this instance, based on Crosby et al. 2007). Pop quiz: Are D. grimshawi and D. melanogaster the most distantly related species in this subsample of the genus? 9 comments to What’s wrong with this figure? (Round three). The most distantly related species in this phylogenetic tree would be those separated by the most nodes (or lineage-split events), right? Therefore the distance (in nodes) between D. melanogaster and D. grimshawi would be 6 while the greatest distance between taxa (and therefore most disparately related) would be 8 nodes between the clades D. simulans/ D. sechellia and D. mojavensis/ D. virilis. This conflicts with the “taxononomic order” of the graph. No, counting nodes is not informative because you could add or delete taxa to alter the number of nodes without affecting relationships. Instead, count the number of common ancestors shared by the various species. For example, how many common ancestors are shared by D. annanassae and D. willistoni versus by D. simulans and D. willistoni? I’ll take the pop quiz. 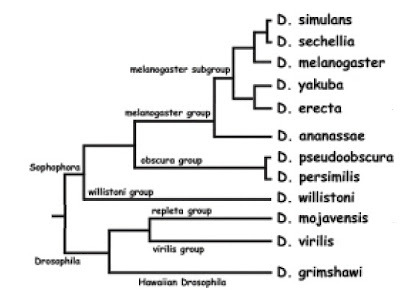 All species in the melanogaster group are equally related to D. grimshawi since all of them shared one common ancestor with D. grimshawi. Ok, how about D. mojavensis and D. melanogaster? D. melanogaster is equidistant to D.mojavensis and D. grimshawi. However, D. mojavensis is more closely related to D.grimshawi than D. Melanogaster is.